When preparing for his day trading activities a trader often has little or no idea as to the trading style he will choose to use that day. When preparing for his day trading activities a trader often has little or no idea as to the trading style he will choose to use that day. He often chooses to begin with no bias to the short side or the long side either. Most likely he is not actually using a trading system although he believes in a systematic approach. Many of his trading decisions are based on his interpretation of chart patterns along with what he deems to be the best entry and exit strategy. This process may include using support and resistance levels to trigger his buy and sell signals. Time is probably not even a consideration other than the time period of the chart he chooses to follow. Taking an almost fearless approach to day-trading the market, he believes he will achieve success by going where the market will take him using his interpretation of the order flow. Early in the session he may achieve moderate success, but then begins to suffer a few setbacks. A small series of losses occur and he is forced to become more analytical about his approach. The problem is he hasn’t figured out exactly what he is looking for. His reliance on “going with the flow” of the trade has blinded him from becoming aware of the tendencies of the markets. These may include the expected movement per day or intraday, as well as time of day. Besides the chart patterns and quality indicators generated, Autochartist also provides an analytical tool for traders that offers insight into the relative movements of the Forex, Futures, Index CFD, and Equities markets. This information can prove to be a valuable resource for traders when assessing the reward/risk of a particular chart pattern by providing the trader with information regarding possible price projections, risk parameters, and time-related tendencies. 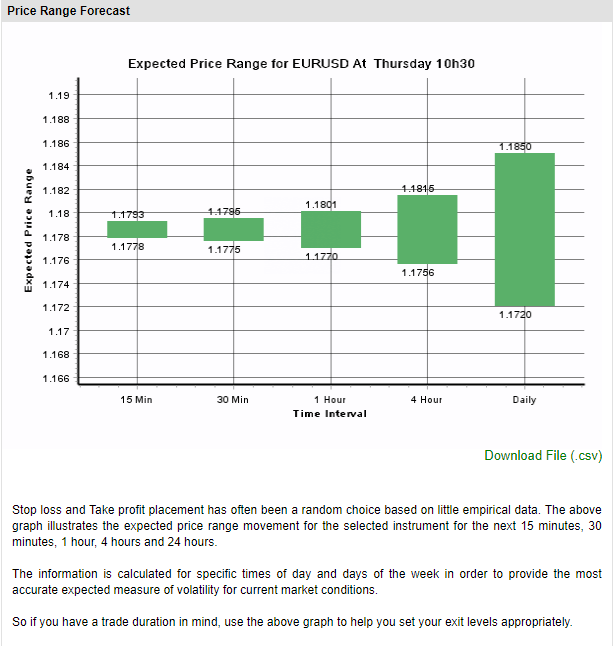 Autochartist Volatility Analysis is the analytical instrument which provides for the Forex trader, for example information on the average pip movement during specific time frames, the likelihood for upside or downside momentum (based on history), the maximum expected price movements (statistical highs and lows) across various time frames, and expected price movements over weekday and hourly time frames. The average movement during specific time frames is important information for a trader because it takes the guesswork out of trying to figure out where a market will move, or if upside and downside objectives are reasonable. Instead of trying to manually figure out profit targets and stop losses while determining which trade position to enter, a trader can use empirical data to set stop loss or profit targets, thus eliminating the randomness of such a choice. Unless it is a news or event driven day, the financial markets have tendencies to trade more actively during certain times of the day. The most active time periods tend to be the openings and the closes of the various financial instruments. Volatility and volume which are the main drivers of price action usually exert the most force during those two time periods. Since the financial markets trade 24-hours per day, these opens and closes occur at various times during the day, giving the trader ample opportunities to take advantage of the excessive movement. There are also, however, times during the day when the markets simply trade flat. Even the best chart pattern set-up can fail when there is no one there to trade it. 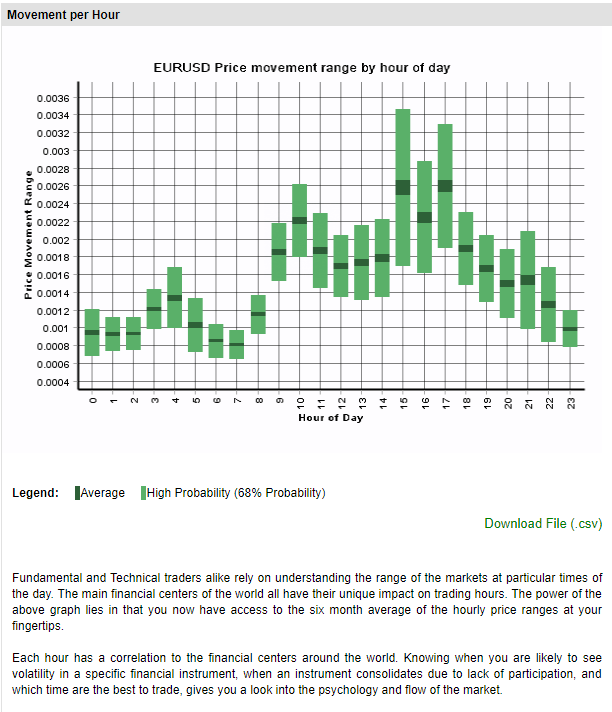 Volatility Analysis offers an analytical tool based on the six month average of the hourly price ranges to inform you of the time periods when specific markets are more active. This information may assist you in finding trade alerts which can help you understand why markets consolidate. With this data you may be able to determine which markets are beginning to enter consolidation periods or which markets are getting ready to move out of consolidation. This information may give you an edge when selecting chart patterns which indicate a breakout move may be in the offing. 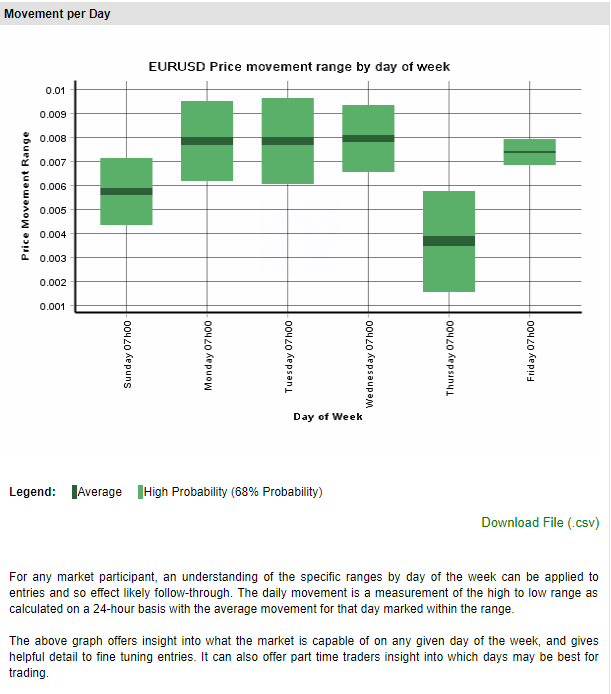 This Volatility Analysis tool offers insight into what the market is capable of on any given day of the week. This information can be invaluable, especially when used along with an economic calendar which shows you when important economic events are going to take place. The data is a measurement of the high to low range as calculated on a 24- hour basis with the average movement for that day marked within a range.  Do you find yourself unable to hold onto trades until you arestopped out based on your strategy?  Do you find that you are stopped out right before your trade goes in your direction?  Do you often trade on the hope the market will move in your direction quickly? If you answered yes to any of these questions, then you should try to work Volatility Analysis.